23-09-2018 . Sunday. Chennai. 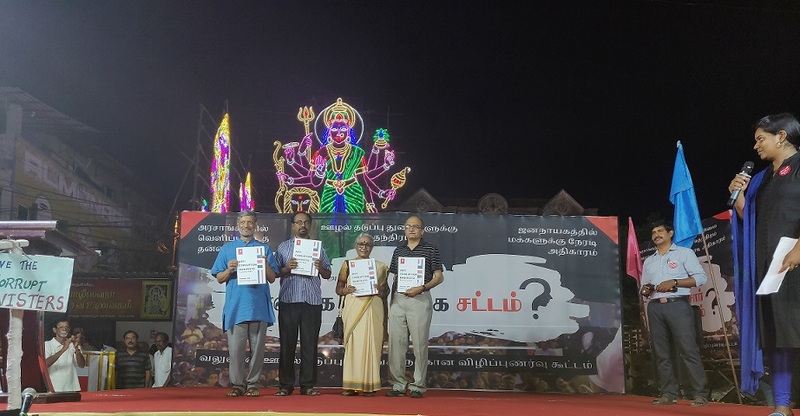 Mylapore: Arappor Iyakkam along with common citizens and groups against Corruption organized a Public Meeting called ‘Ennaga Saar Unga Sattam’ calling for citizen’s action to create awareness among the masses on ways to curb corruption at Mylapore Mangollai on September 23rd, Sunday at 5 PM. Thousands of people participated in the gathering. A study by center for media studies said that 68% of the people surveyed had to pay bribe to access Government services and we have been ranked amongst the top corrupt states. From VAO office to the Minister’s office, the corrupt have been making a huge kill out of the common man and the current day politicians have failed us again and again. The nexus of the corrupt is becoming stronger by the day and the call is for a stronger citizen’s action to subvert this and work towards Transparency and Accountability. Increasing people’s participation in Democracy and decentralizing the power structure. The campaign will work towards solutions of Transparency and Accountability. Bringing Lokayuktha in the state and implementing Lokpal at the centre, creating law for protecting whistleblowers in the state and creating a forum for bringing out big corruptions, expose of corruption in each Department, campaigning and working towards establishing Transparency and Accountability in each Department, creating awareness amongst citizens about right to information and ways to get Government services without paying bribes are some of the key aspects of this campaign. 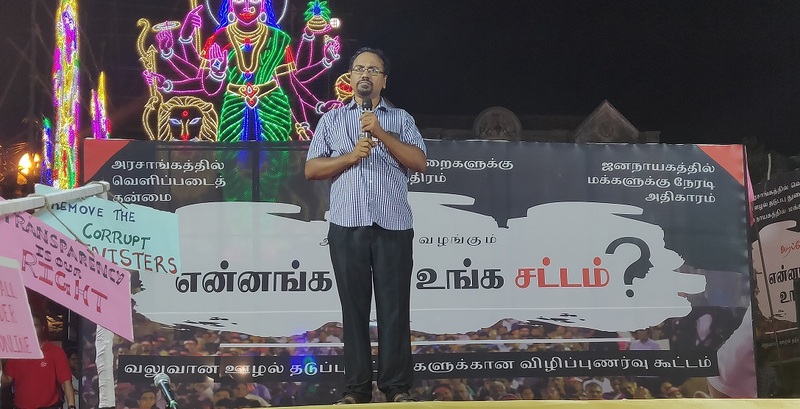 Arappor Iyakkam’s Convener Jayaram Venkatesan spoke about the big corruption in the state as a result of the nexus between Politicians – Executive – Corporates – Mafia. Senior Supreme Court Advocate Mr Prashant Bhushan spoke about various corruptions across the country and the gaps in the laws that curb corruption. Social Activist Mrs Aruna Roy spoke about the role of Peoples Movements in curbing corruption and enforcing anti corruption laws in the country. Dr V.Suresh of the PUCL spoke about practices of good governance and legal ways to fight corruption. Social Activist Mr Nikhil Dey spoke how Corruption turns into black money and the effect of it on economy. Arappor Iyakkam released the first draft of its Anti Corruption Manifesto and the same will be published in its website www.arappor.org where public can send their feedbacks for the next one month about the manifesto. Once finalized, Arappor Iyakkam will take the Peoples Anti Corruption Manifesto to all Political Parties across the State and National parties and pressurize them to include the same in their Election Manifesto.